9/1/13 by Amy Waldman- This is the first article in a projected series on little discussed or publicized problems and issues within the Jewish community. Decent, generous and pious people die in many ways, including by suicide. When that happens, it can leave us — and those who want to comfort us — at a loss for how to proceed. A generation ago, suicide was simply not discussed. Both mainstream America and the Jewish community have gotten better at addressing issues around suicide and suicide prevention. But better is a relative term. In the past few months, there have been several suicides in Milwaukee’s North Shore area. The individuals ranged in age from teen to adult, and were male and female, Jewish and non-Jewish. All left family and friends, who need and will continue to need understanding and support. Mental illness can play a part. But having a brain disorder is not a predictor for death by suicide. Dafna Berman, a psychotherapist at Jewish Family Services, emphasized that a lot of people who live with mental illness never attempt suicide, and some people who die by suicide have no documented history of mental illness. 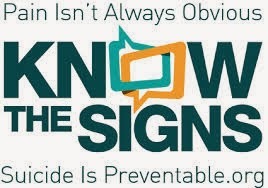 For that reason, Berman said, it’s very important that non-clinicians and community members are aware of the warning signs indicating that someone might be in danger of taking his or her own life. “People who have [died by suicide] do interact with loved ones, with colleagues and with neighbors,” she said. “If you know how to identify them, the signs are there.” Berman said signs might be comments that a person feels that his or her life isn’t worth living or that they’re a burden to others. They may give things away, or say goodbye. “Take all declarations of suicide seriously,” Cohen said. “Don’t bear the knowledge alone. You want to make sure that someone, preferably a mental health professional, is involved in the situation.” In a situation where a death by suicide occurs, Cohen said he does not talk around the cause during the eulogy. Both Berman and Cohen said there are specific things that friends of a suicide survivor can do to help start that healing process. For family and friends of a person who dies by suicide, support groups can play an important role in the grieving process. “I highly recommend that anyone struggling with the loss of a person to suicide find a support group because it’s a very safe place to talk about their experience, and it’s a unique experience,” said Melanie Wasserman, a psychotherapist in private practice at Health Psychology Associates in Milwaukee. Ellen Abrams Blankenship co-facilitates an open-to-anyone monthly suicide survivor’s support group at the North Shore Library through Mental Health America of Wisconsin. A counselor and professional facilitator, Blankenship said support groups differ from therapy groups in that the focus is not on treatment outcomes. Blankenship said that in the two years the group has been meeting — she joined as co-facilitator a year ago — it has been as small as three and as large as 15. Both men and women attend. Although she and co-facilitator Linda Berman, let attendees define the scope of the sessions, Blankenship said that she and Berman always begin them the same way. Amy Waldman is a Milwaukee-based freelance writer and coordinator of the ACCESS Program for Displaced Homemakers at Milwaukee Area Technical College. The American Association of Suicidology has designated the week of Sept. 8-14 National Suicide Prevention Week: www.suicidology.org. The National Suicide Prevention Lifeline, run through the federal Substance Abuse and Mental Health Administration, is a 24-hour phone line staffed by trained counselors: 1-800-273-8255. Mental Health America of Wisconsin: 414-276-3122 and www.mhawisconsin.org. The North Shore Library Support group meets from 6-8 p.m. on the third Wednesday of each month. For people in crisis: www.metanoia.org/suicide; suicideproject.org.